I love chocolate SO MUCH! In fact, it’s always been my downfall when dieting. But if anyone knows of ways I can enjoy it without packing on the pounds, it’s YOU. What’ve you got for me? I’m actually more of savory food fan myself, but that doesn’t mean I can’t help you out! It’s completely possible to indulge in chocolate treats in a healthy way, and I’ve got nine recipes that prove it. Plus, I’m debuting an entire episode of Hungry Girl: Chew the Right Thing! all about GUILT-FREE CHOCOLATE. No chocolate lover should have to live without cookies, cake, and pie... So that’s exactly what I’m serving up next! Check Out “The Chocolate Episode” of Hungry Girl: Chew the Right Thing! * Chew & Tell: Trader Joe’s chocolate finds! 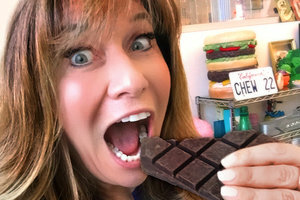 * Lisa Loves It: my 60-calorie chocolate obsession! Click now to listen... or to subscribe and listen later! Today, June 13th, is National Kitchen Klutzes of America Day. Good thing today’s recipes are super easy... Stay away from the mandoline slicer, people! We all know someone who’s obsessed with chocolate… Click “Send to a Friend” to share the sweetness!